In an ETF the stock selection method (presumably) does not change. In this way, you can determine what style of dividend ETF has historically outperformed - and what style has the highest likelihood of continuing to do so. Still: Past performance is no guarantee of future success, but it sure doesn’t hurt. I’d much rather have my money with a manager who has a historical record of outperformance (like Warren Buffett) than someone who as a historical record of losing money hand-over-fist. The Dividend ETF mentioned above has more than USD 1 billion in assets under management (status: April 2016). 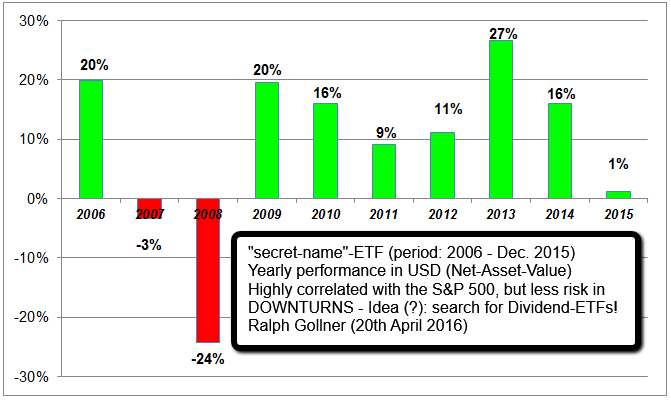 Furthermore, the ETF is having a lower price standard deviation (Volatility) than the S&P 500. 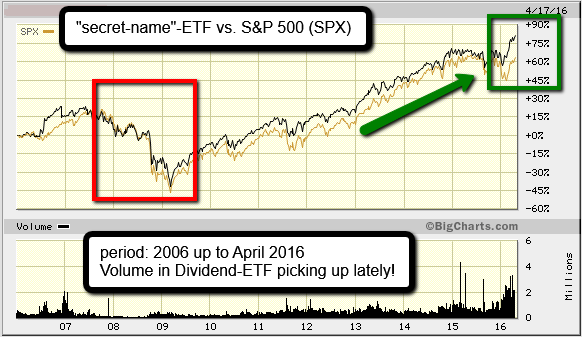 As a result the dividend-ETF has a superior Sharpe ratio than the S&P 500 (risk-adjusted return).